Today we have Vani of Mysoorean share her culinary journey through Mysore’s (a regional cuisine of Karnataka) food culture. Mysoorean is run by Vani, an Indian food blogger based in the US. 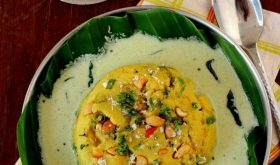 In today’s article, Vani explores Mysore cuisine and also shares two simple recipes that are sure to whet your appetite. Do visit Vaniâ€™s lovely food blog to learn more about the food traditions of Karnataka and Mysore people as well as some traditional Mysore food recipes. Thank you, Vani, for taking time to share with us your regional food cuisine! Dear readers, please give a warm welcome to Vani. Mysore, the city of palaces, is a popular tourist destination in the state of Karnataka, in Southern India. Historically, Mysore kingdom was ruled by the Wodeyar dynasty, though it was a part of the Vijayanagar empire for a while and under the rule of Hyder Ali/Tipu Sultan later. The Wodeyars were great patrons of art and culture, which is amply reflected in the rich legacy left by them. Dasara festival brings that out in all its glory, with renowned artists and groups performing classical music, dance, drama, folk arts in concerts and shows all around the city. The beautiful palaces, the art galleries, the temples, the old buildings, the greenery, the lakes and the parks, all showcase the beauty and splendor of a city that once was and still is, in many ways. Mysore is famous for its silks, sandalwood, handicrafts, agarbathies and of course, the sweet Mysore Pak. Just as there is no one “Indian cuisine”, there isn’t one “Mysore cuisine” as such either. 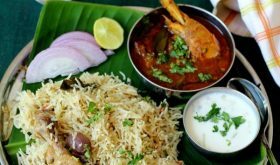 The city has a majority Hindu population with fairly large Muslim, Christian and Jain communities as well, all with distinct dishes and methods/philosophies in cooking. And within the Hindu religion are the various sects, each having their own unique dishes. Ragi mudde (finger millet dumplings) with bassaaru (rasam made with the broth of pulses and/or greens), mutton and koli (chicken) saarus is a staple in the Gowda community. They are also known for their mutton chops, kheema and pulao. 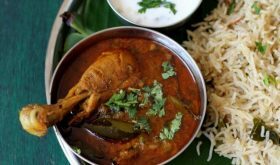 Kodavas (who are originally from the neighbouring district of Coorg) have their own fabulous fare – pandi (pork), chicken and other meat curries, steamed dishes (called noolputtu, kadambuttu etc), ottis (rice breads) apart from a whole range of vegetarian side dishes. What I’m writing about today mainly reflects the typical foods in my community, many of which are typical to other communities in the Mysore-Bangalore region as well. Rice is a must-have in our pantries. It is almost akin to cutting off a limb if we ever run out of rice! You may find rice dishes in all courses (from soup (ganji) through dessert (payasa)) and in all meals throughout the day. For breakfast in the form of rottis, idli and dosas, avalakki (poha), otthu shavige (home made thin rice noodles) etc. Cooked rice with various accompaniments for lunch/dinner; as spiced rice bhath with vegetables and masalas; cooked with dals in huggi and bisi bele bhath; and in sweets like payasa. We use it in all forms – flour, flat or beaten rice, whole, creamed, broken, puffed – you name it, we do something with it! It is the main source of carbohydrates in our diet. A typical Mysore breakfast includes South Indian staples like dosas, idli, uppittu (upma) and avalakki (poha). 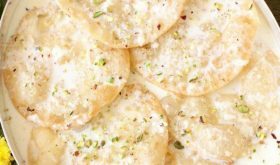 Apart from these, akki rotti, raagi rotti, pooris with saagu or aloo bhaji and rava idlies are also commom. 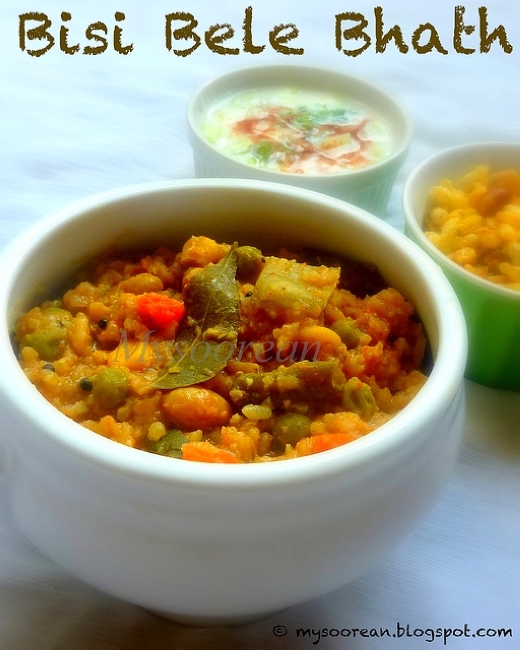 Rava (semolina) uppittu is the most popular amongst upma varieties. We also make upma with akkitari (broken rice) and with a spice powder called vangibhath pudi in rava bhath. Rava dosa, raagi dosa are some of the variations of dosa, apart from the more famous Mysore Masala Dosa. Everyday meals are pretty simple, though always wholesome. Rice, as I mentioned earlier, is a staple in every house. Wheat based phulkas, rotis etc aren’t traditionally a part of our cuisine but they do appear often, if not daily, in meals these days. Rice is served with some form of dal/lentils. From simple seasoned dals through spicy, vegetable heavy huli, kootu etc (see glossary below) – form the protein element in a meal. There are one or two vegetable sides (varieties explained in glossary below) and pickles (lime, ginger mango, mango etc). Every meal ends with rice mixed with yogurt/curds and/or a glass of spiced buttermilk (majjige). 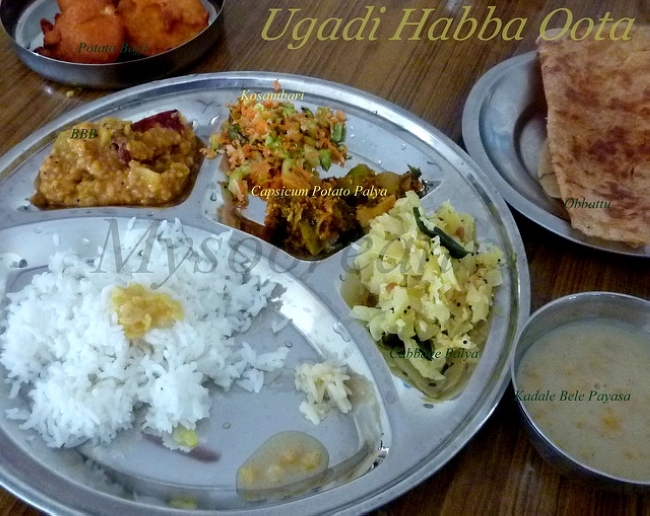 A typical “Habbada Oota” or festival lunch – Payasa (kheer), palya (dry bhaji), kosambari, holige or obbattu, aloo bonda and bisi bele bath. Saaru (rasam), huli (sambar) and mosaru (yogurt) are the remaining dishes, not seen in this picture. For special occasions such as weddings, festivals etc, the food gets as much attention as the festivities. Food is served on a plantain leaf, with designated spots for each dish. Dishes are served in a particular order too. 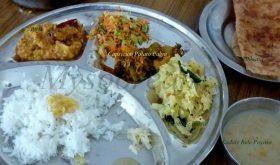 Payasa, a sweet, is served on the bottom right first, followed by salt, pickle, two types of kosambaris (raw salads), two palyas (dry vegetable curry), gojju (tangy-spicy curry) and/or majjige huli (vegetables in yogurt gravy), then a spiced rice followed by white rice, thovve (lightly seasoned dal) and ghee. You start eating only after all these are served. Then comes saaru (rasam), huli (sambar), fried fritters and sweets. The final course is always curd rice and majjige (spiced buttermilk). Here is a glossary of our typical dish names with links to some typical recipes for those. Avarekayi/field beans (mochakai in Tamil and a close relative to papdi lilva) is another obsession with us. Come avarekayi season, you will find a kind of frenzy in Mysore (and Bangalore and surrounding areas) that only this bean can bring. It is on the menu every day, if not every meal! From breakfast through dinner, it will make appearance in some form or the other, especially at the beginning of the season. Avarekayi is spread out in heaps at the markets, on carts and baskets, discussions about the prices and the crop that year, dishes made, recipes exchanged – it is a season of joy! Bangalore actually hosts an Avarekayi Mela that lasts over a week in December, where you will find stalls upon stalls of vendors selling field beans fresh from their farms and food stalls selling only dishes made with avarekayi – from dosas, idlies and vadas to sweets like holige(obbattu)and chikkis! Akki rotti, usili (salad), saaru (rasam), huli and upma are some of the other delicious dishes made with this. 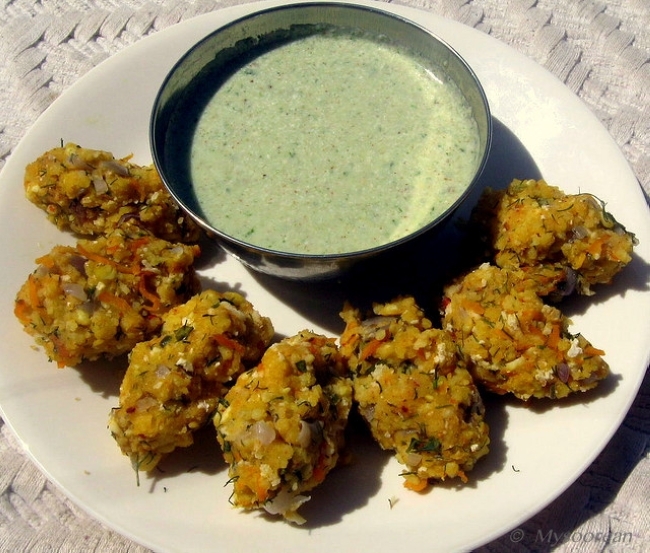 Kosambari is a delicious low-fat and nutritious raw salad traditionally made with split lentils (chana dal or moong dal) and vegetables (cucumber and/or carrot). Two types of kosambari are made on festival days and special occasions. It is one of the side dishes in a meal but I’ve had many a kosambari as a meal by itself! Soak chana dal for 2 hours. Wash a couple times, drain and keep aside. Chop cucumber. Set aside for 10 minutes, then squeeze out as much water as possible. 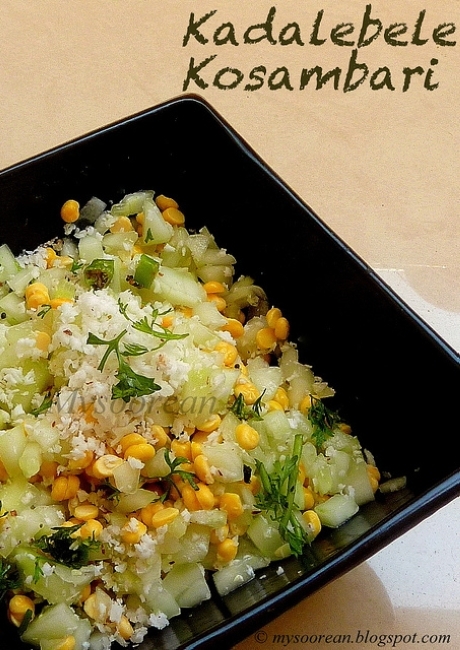 Mix in the softened chana dal, cucumber, green chilies, coconut and cilantro. Just before serving, add salt and lemon juice. Kalasida Anna or mixed rice (sometimes just called bhath) is very common in the Mysore region. Rice is mixed with spices and/or vegetables and eaten with a raita (a yogurt salad) on the side or sometimes with just some ghee on top. 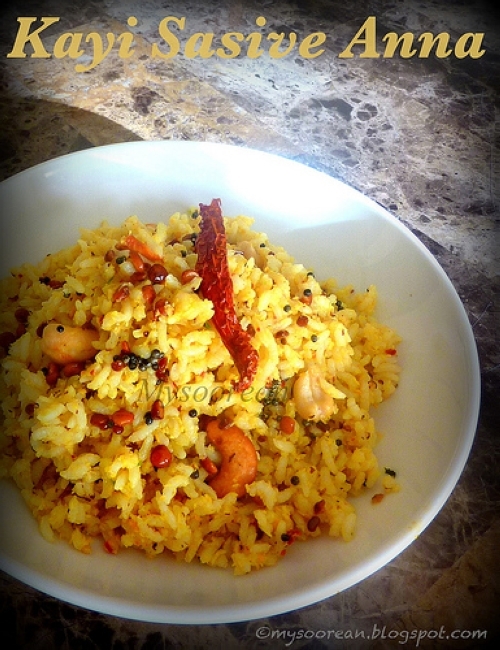 Sometimes rice is mixed with tadka and coconut or made a bit more elaborate with ground masalas and spiced vegetables. Chitraanna is rice mixed in a simple tadka, with a sour agent like lemon or citron (heralekai in Kannada). Vangibhath is another popular kalasida anna, where rice is mixed in with various vegetables and a fragrant spice powder called vangibhath pudi (MTR brand makes a very good one). 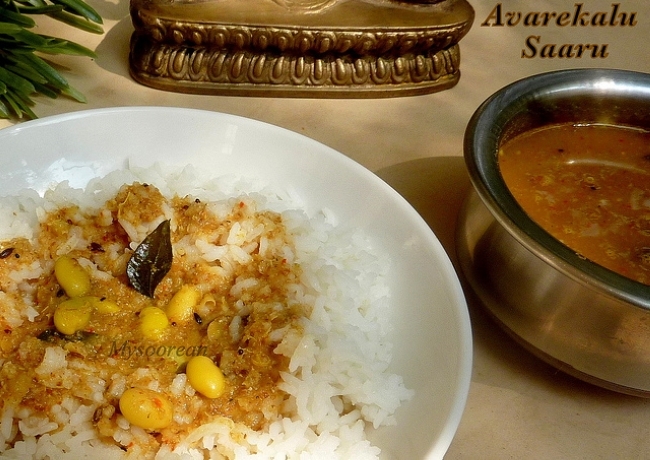 A rice based recipe that I am sharing with you today is called kayi-sasive anna, literally meaning coconut-mustard rice. The ground chutney can actually be stored away in the refrigerator for a few days, to be used later either as a chutney or as a masala in a rice. I’d like to thank Sailaja for inviting me to write about foods from the Mysore region. Given the culinary diversity even within states and regions, her series “Indian Food Trail” has been an excellent initiative to showcase the rich variety of foods that fall under the all-encompassing term “Indian cuisine”. The Indian Food Trail series has been very informative and interesting and I’m delighted and honored to have been a part of it. 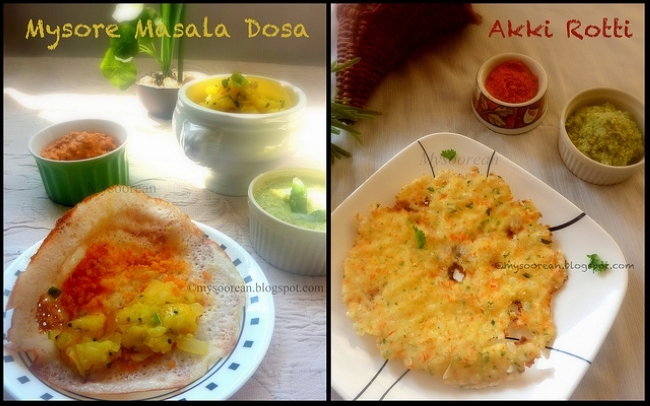 Listed below are guest posts on different Indian regional cuisines by fellow food bloggers. Cook rice in 2 cups of water, making sure the rice does not get mushy. Spread the cooked rice on a platter to cool. Fluff with fork to separate grains. Keep aside. Make a smooth paste with the "to grind" ingredients, with very little water. Keep aside. In a wide pan, heat oil and add mustard seeds. Once they pop, add peanuts and the dals and fry for a few seconds. 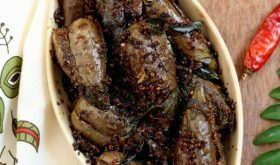 Add remaining ingredients one by one and fry until the dals get slightly browned. Add the ground paste and fry for a minute. Let cool. Mix this with the cooled rice and salt to taste and serve. By Sailu Published: January 25, 2013 Follow the Indian food trail as Vani embarks on a culinary journey through Mysore. Learn about Mysore cuisine, food recipes and their food culture. Gosh Vani- you’re making me so hungry! What a delicious post. I particularly appreciate the culinary glossary you’ve included to make sense of different dishes. Sailu, thanks for hosting this fantastic series! Thanks to Vani & Sailu for the delicious journey of Mysore!! Enjoyed reading, had a feast for the eyes & will surely fulfill the temptations by making some the dishes. Looking forward to more of such culinary travels.. Thanks, Deepta. Did you check the other posts in the IFT series? Very interesting. now I know what all to eat when I come for the Mysore half Marathon next year! A lovely write up, mouthwatering food and enjoyed it! Thanks, Gauri. Enjoy the marathon! Vani – so many wonderful dishes and every one of them look so wonderful. You are a true Mysoorean 🙂 Want to try them all out. Thanks!